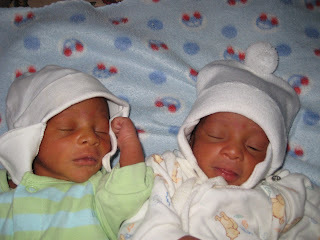 These twin came to HCH in February 2007 weighing in at 3lbs 3oz, and 3lb6oz. 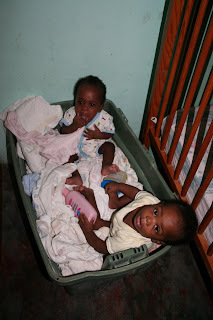 Christopher was on oxygen for a while, and they spent 6 months in our home and then were returned to their parents. The first picture is from when they were 7 months old, and the second picture is of them visiting last week. They are walking on their own now and are quite active. Isaiah is coming along well. We've been giving him lots of milk and now he is eating food. The swelling in his face is going down slowly but surely. He holds both hands to be picked up when I go in the room and also has a ready smile. His dimples are so cute! Samuel now has gained 2 1/2 lbs, bringing him up to 6lb 6oz. He turned one month on the 5th, so by now he's actually a month and a half. He's drinking formula and sleeping well. But when he's hungry, everybody knows it!! And he's often hungry!! I have wanted to write about the twins, but since they were sick, and then after losing Simon, it's been hard to know what to write. 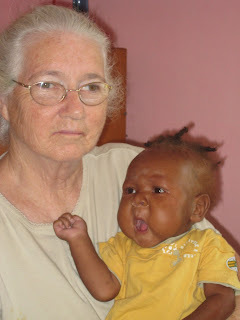 Samuel got sick first and was very jaundiced. Then about a week later Simon became ill and jaundice as well. This took us by surprise as they had seemed to healthy when they arrived. 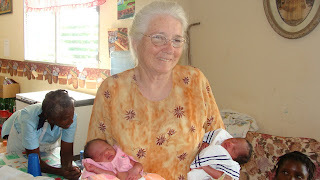 Their mother had died after birth, and we had recieved no information as to what the cause of her death was, or any medical history. Samuel pulled through the illness slowly but surely, and is now doing fine. He is undergoing some tests to see if there are any abnormalities due to his sickness and the death of Simon. Baby Simon did not pull through his sickness. 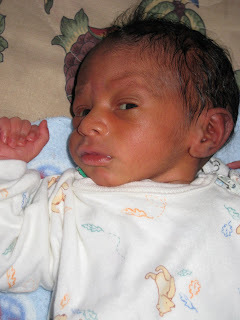 He was very very yellow due to jaundice and was very ill day in and day out. He fought for life, and Melinda and I stood by his bed trying to help him, but to no avail. We prayed for him, and at last it was very hard for to me to realize that I had to resign myself to whatever God's will was. On the last morning when he was so sick, I told God that I knew Simon was His, and that if He was not going to heal Simon, to not allow him to suffer anymore. One of the hardest things in my life was having to watch Simon die as he did that morning. On his last day I told him how much I was going to miss him, but that I knew he was in God's hands. 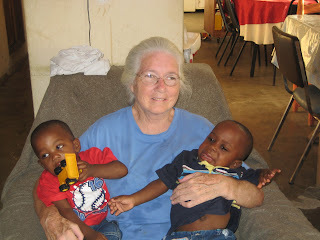 Melinda and I shed many tears after he was gone. He will forever be remembered as part of our family. Meet Isaiah. 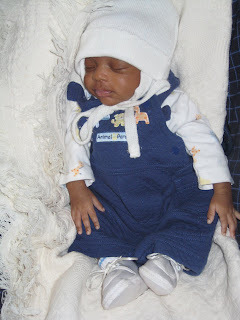 He came to us at 9:oo this morning with his father and maternal aunt. 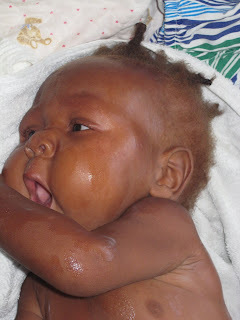 He is 6 months old and appears in fairly good health, except for what appears to be the beginnings of Kwashinor's Syndrome, which is proetin deficiency malnutrition. 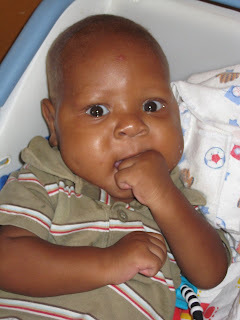 His mother has been sick since his birth and stopped nursing him at 3 months. She is paralyzed and unable to talk. The family is not economically able to care for him, and have asked us to take him into our home. Isaiah has other siblings at home who are 6, 8, and 10 years old. Please pray for his family and that he will have an easy transition into our family.